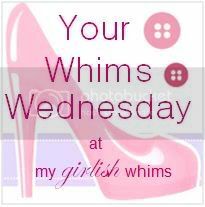 Don't forget to link up to my Marvelous Mess party!! 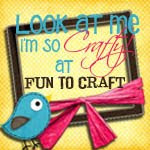 Each week I pick on project to feature on my sidebar!! PS. 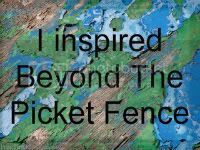 If you don't want to do all the legwork on this part of the project, go to this site and input your latitude, hit enter, and "download the original post script". Print out what you get and skip to step 4. 1. The first thing you need to find to make a horizontal sundial like mine above, is the latitude of your location. Mine was near 44 degrees. This is important because the *Gnomon* (which is the big pointy-guy that makes the shadow on your sundial) needs to be the same angle as the degree of your latitude. Therefore.....my latitude was 44 and the Gnomon I used needed to have a angle of 44 degrees to make the correct type of shadow on my sundial. Make sense? 2. 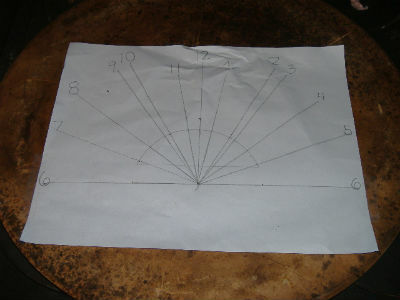 The degree of your latitude is also important in correctly making the hour lines on your sundial. Use THIS site to input your latitude and get the results of your hour lines. Using your protractor and a piece of paper make a sketch of the face of your sundial, beginning with a straight line and using 12:00 as 0 degrees. 3. 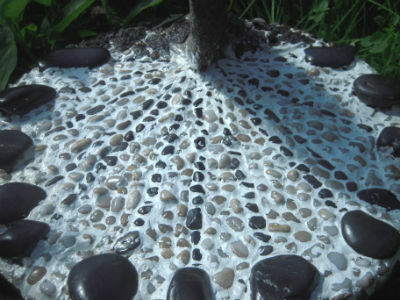 Get your stones ready to be placed and when you've set yourself up with about half an hour of undisturbed time......spread the mortar on the pizza stone. Make sure you leave enough room on the stone for your gnomen (mine was big and needed a good amount of space. 5. At the head of each line, I placed a big dark stone to represent the hour mark. Down each hour line, I used more dark stones (you will want to be able to see your hour lines clearly to be able to tell time). 6. 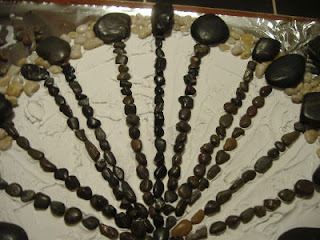 After that, I filled in all of the rest of the space with lighter colored stones. 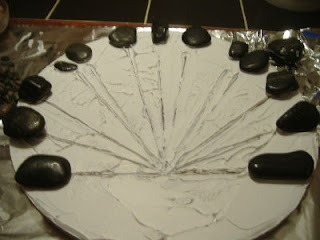 Then, I worked on the gnomon and placed it in the middle/bottom of the design and filled in around it with other rocks. Make sure, before you place it, that your gnomon is the correct height....a short gnomon will not leave enough of a shadow to see the time. 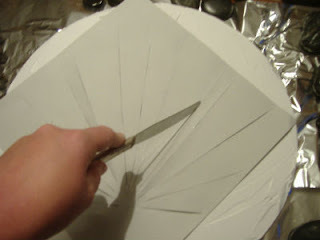 I can't find the site where I found this tip but I remember reading that if you make your gnomon to be at least half the size of the entire plate, you should be good. 7. Make sure you use extra mortar around the gnomon if it is big and heavy like mine!! 8. Let the mortar dry as long as the directions say, and then grout it all (following the directions on the grout package as well). Once everything is completely dry, spray the face of the gnomon with clear acrylic spray to help waterproof it. 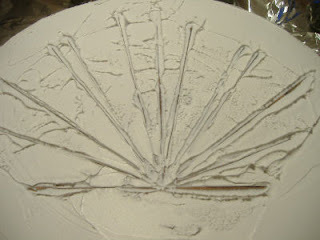 I didn't spray my gnomon (except on the very base of it) because I like the way it looked as it was. 9. Find the spot where you would like to place your sundial (hopefully in full sun to get the full effect!!) and make sure that whatever it will be set on is level. 10. Set the sundial down on the base (I used a tree stump!!) and find "True North" on a compass. Compasses are usually aligned to Magnetic North, so you will need to do some calculations to figure out where True North is in relation. There are other way to find True North :Here is one SITE to give you some options. If you decide to use a compass, go HERE to figure out your magnetic declination using a calculator. Then use that information and go HERE to figure out how to use it. That is it!! Told you it was kind of complicated. 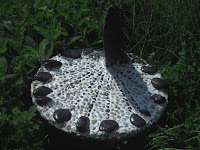 But, I am so proud of my first accurate Sundial......AND my FIRST Mosaic!!!! Want to see a few more pics of the finished project?? That is beautiful. 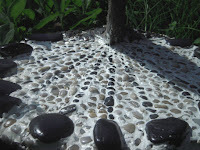 The kids and I have made stepping stones before but I LOVE the sundial. Very fun. I love this idea. I love that you used rocks and pebbles for your sundial!! What a great sundial, congratulations. That looks great. 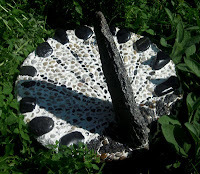 I would love for you to stop by http://diyhshp.blogspot.com/ on Monday to link up your sundial and any other projects you would like to share. This is so beautiful! Great job! Thanks for sharing:) You got a great space here. Oh, wow a working sundial. I am so impressed you made it accurate. That is fantastic! Thanks for linking it up at HSH! Very cool! It turned out great, way to go!